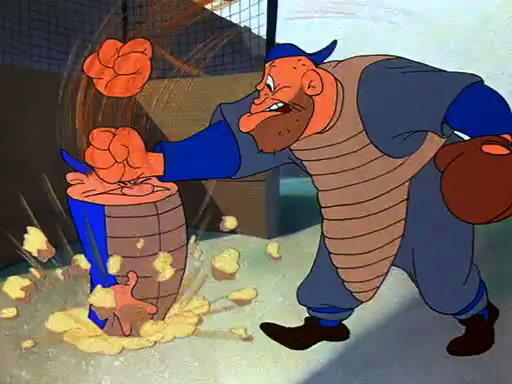 This post revives an earlier debate about dramatic activity/passivity in slapstick. This clip is an abridged version of what drives the whole short: a man can’t help but flirt with the camera. Or is he courting with the audience he anticipates. Or is he in lovestruck with the cameraman? It’s hilarious, and you can extrapolate Chaplin’s entire cinema based on the few clownish emotions and dramatic ideas it presents. This bit from Tramp, Tramp, Tramp (1926), especially when looked at after Chaplin, is spinning with ideas about spectral identity and other Hegelian/psychological head-busters: Can activity (action) operate as passivity (inaction)? More mysteriously, can inaction ever NOT be a type of action (NOTE: the outgoing U.S. Congress, the 112th, earned the moniker “D0-Nothing Congress” but this is of course a misnomer; if the press were more analytical they would have more accurately named it the “Do-Everything-We-Can-Prevent-Action Congress”), as the only achievable passivity is in a thing’s non-existence, which then can’t be discussed in terms like “achievable” so why are we even talking about it? This is why Langdon’s gag is so phenomenal (NOTE: the joke may or may not have been written by Frank Capra). A movie star playing camera shy running from a camera is first hilarious, secondly thought-provoking, (both of these are apt to describe KAR) but third, it’s twisted, inserting a bit of tragedy into the tomfoolery. There’s an element of the nightmare, of terror, of the uncanny. In general, what is uncanny can not be entertaining, which is why Chaplin always framed (and in some cases masked) disturbing or uncomfortable subjects like war or poverty or Fascism in moral righteousness and divine/poetic justice, aka: a happy ending (despite his Tramp’s ambiguous future at the end of most of the features). Langdon however is not a sentimentalist. If anything he’s a surrealist, upending our ideas about story and narrative by withdrawing from reality and, through slapstick logic, guiding us somewhere strange. Currently in the middle of Lajos Egri’s sole work, where the Hungarian tailor-turned-theater-director first describes the existence of three-dimensionality to fully realized dramatic characters, an observation the slapstick genre successfully subverts. More on this point later. First, there’s a crux in the book (the middle, right, where else?) where the author really digs it to Aristotle for claiming character is subordinate to action. Now, to be fair, Ergi’s whole work is really the first substantial study to emphasize the role of psychology (the third dimension to basics, physicality and sociology) as well as the internal dialectics of character that work in the creative makings of a memorable play. And to be fair, too, Egri’s point on Aristotle is instructive. But it’s also totally confused. Egri faults Aristotle based on this confusion: Aristotle wasn’t a playwright, he was a philosopher. So when the ancient Greek writes in his Poetics about drama and catharsis and all that good stuff he does so as a witness to theatrical drama. Aristotle is discussing the appearance of drama unfolding before the crowds, an essential component of what dramatic theater is. So, if you remember this then it absolutely is true that, as Aristotle put it, action precedes character: it is through a character’s motions that an observer derives their motives and begins to compile a picture of character. This is full blown within the complexities of cinematic slapstick. Take the case of Harry Langdon’s “The Odd Fellow” in his masterpiece Three’s A Crowd. It’s one of the most psychologically insightful comedies ever made, but also the film that best explores the passive nature of Langdon’s comic persona, a concept Egri deplores and considers poor drama. The riddle is how can passivity be three-dimensional? Three’s A Crowd (1927) is radically dream-like and structurally experimental (second perhaps only to Field’s Never Give a Sucker an Even Break of 1941) and especially so considering it’s a piece by a silent clown of the twenties. The logic of the story is full of odd jokes: washing dishes with a clothes washing board (but Odd Fellow never realizes his mistake); an absurdly long staircase separating characters to and from points of action (an architectural quirk never explained); and an inanimate rag-doll – Odd fellow’s equally passive doppelganger – bumming around through the harsh seasons, city streets, and unconscious nightmares. The joke are half punch lines, half humdrum. They are abstractions – and featured in the background setting rather that in the decisions of our anti-hero – of all the small things in life that people put up with without thinking about at all. So, it’s these features of the external world that reflect the inner workings of the passive character. Woody Allen has confirmed this idea in interviews, presumably grasped during his post-Annie Hall work with Gordon Willis, saying that for a filmmaker visuals in the outside should reflect the inside emotions (which is Jacque Lacan’s idea of “ex-timacy” for those interested in psychoanalysis). Odd Fellow is the prism for all sorts of miscommunications and hallucinations that move along in an exacting yet illogical way. Anonymous letters falling from the sky, neighbor’s distrusting and ridiculing his every move, floors giving out, abandoned women being extracted from his home just as improbably as they had entered. Harry’s “The Odd Fellow” – unlike a schlemeil, them that can literally do no right – is instead confronted with a host of unnecessary struggles, literally and figuratively, and in a way whose explication evokes comedy rather than Sisyphean tragedy. For that reason Three’s A Crowd should be entered alongside the work of Samuel Beckett, Flann O’Brien and W.C. Fields. This is that point that is a blow to Egri: the external world can, indeed needs to, reflect the character within the language of film. Egri’s specialty was theatrical in nature so we can’t fault him for ignoring the visible reflections of all that he has to offer: character, conflict and progression through dialectics. However, it is in film, and especially evident in slapstick, that passivity in character can be counterbalanced by authorial (later to be identified as Hitchcockian) attention to detail in the background, in the setting, in the universe of the story. 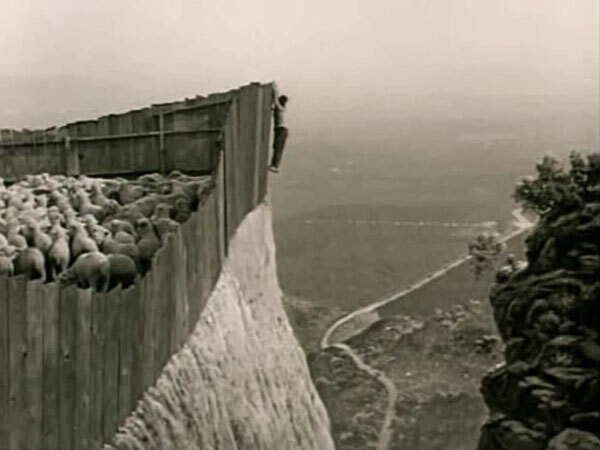 So the facility of psychology in Langdon’s work is relegated to the margins; his internality – especially in this film which was his first to write and direct – is reflected in the world outside. Are gangster films slapstick or not? Crooksters are all the different character variants that exist somewhere between the gangster’s dramatic struggle not to be predetermined by existing social forces of legitimacy and power from which they are excluded, and the huckster, whose painfully comic existence makes everyone around them enraged, confused or appalled thus reinforcing the former’s fantasy of being intellectually superior to everyone around them. But what if the archetypal “gangster” identity, just like the crookster above (and both made iconic in the 1930’s at Warner Brother’s studio), never really extracted itself from the dominant slapstick era that preceded its own popularity? What if Cagney and Robinson are nothing more than Chaplin and Fields stuck in a world full of flying bullets, loose women, bare knuckles and speakeasies? The top clip is from Roy Del Ruth’s Taxi! 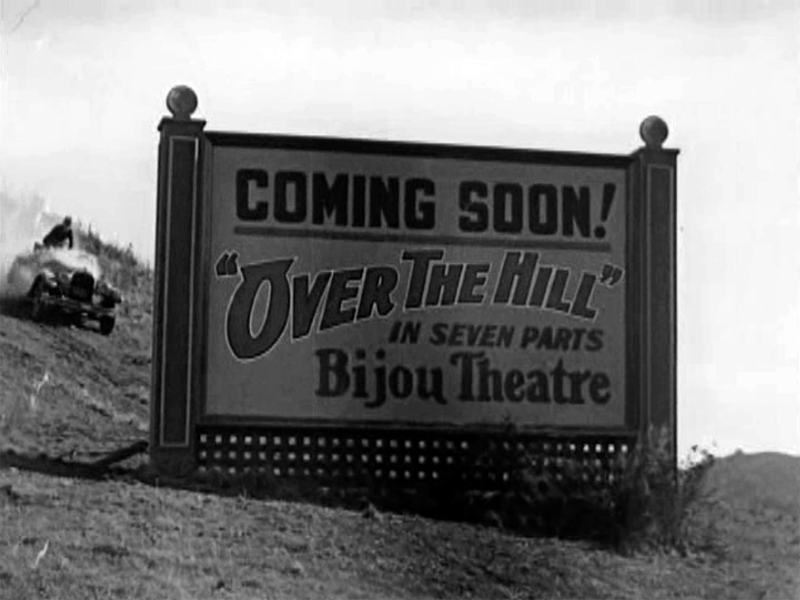 (1932) and, while hardly seen in the context of great Warner gangster films, is nevertheless completely typical of the formula: racketeering, corruption, murder, chips on shoulders driving traditional neighborhood allegiances to contest with a main character’s extra-neighborly ambitions, a street brawl or three and finally some less-than-deep philosophical fadoodling on the nature of right and wrong. 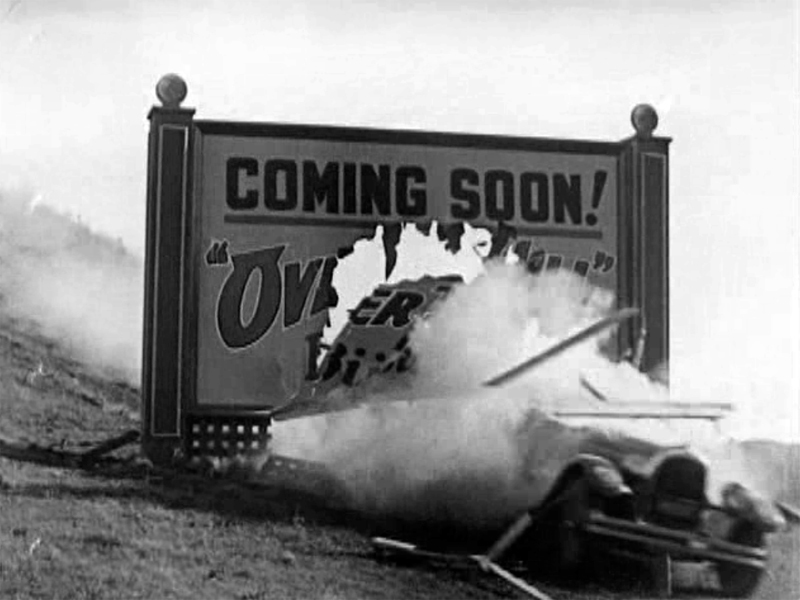 In the scene, one of the film’s openers, Cagney’s character is caged in by two rival taxis and moments later cleans their clocks in a impromptu fist match, all of it egged on by onlookers and passersby. [Note: Roy Del Ruth, like another WB mainstay, Lloyd Bacon (discussed below), was brought up in slapstick and directed films staring Harry Langdon, Mack Sennett and Ben Turpin.] This scene from Taxi! is violent, quick as a newspaper catching fire, and depicts clear adversarial interests. 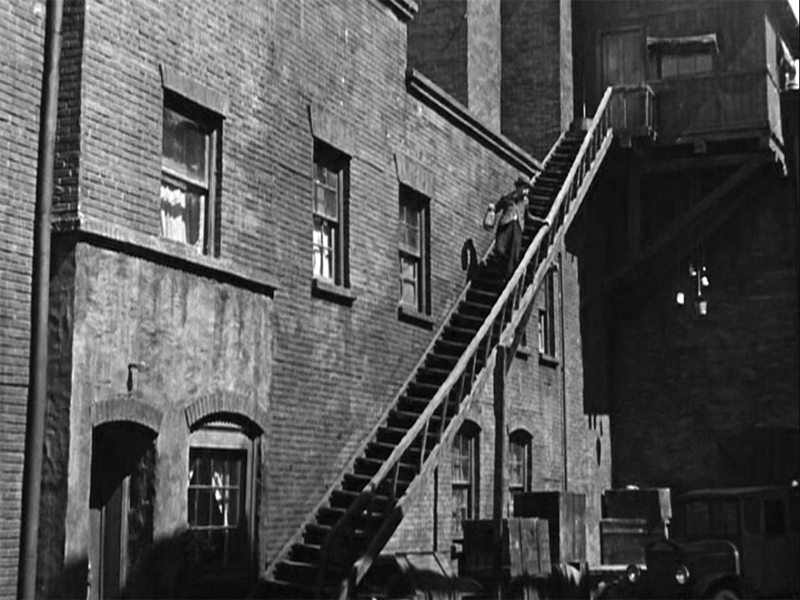 The second clip, from The Man on the Flying Trapeze (1935), W.C. Fields is caged in by two cars and and this slowly instigates a mob-like sapping of the old man’s simplest, stupidest, most private wishes from his tired, ever-shrinking soul. The scene is not explicitly violent, but it is absolutely brutal and painful insofar as public humiliation and arbitrary bullying is a kind of bloodletting even doctor’s can’t stop. But the scene is not quick at all; it’s slow as molasses, agonizing, cruelly drawing in the audience to watch a man with a raincloud over his head get yelled at for being wet by people with the sun on their shoulders. It’s the same story told through two different aesthetics, a through-the-looking-glass moment. More on this questionable parallel in the coming weeks. North America is rapidly becoming a frustrating place to tell interesting stories due directly to the intrusive presence of wireless ‘badgetry’, convergent idiocy and Gen. Digital Shenanigans (two-star General, that Gen. Digital Shenanigans). You simply can’t tell a dramatic story if everyone has access to same universe of information, there exists no barrier between public space and private space, and everyone is connected to anyone they want to no matter where they are or what time it is. If Hitchcock’s war with the MPAA censors during the 1950’s tells us anything about filmmaking, it’s that to realize the dream of total surveillance would be a most boring and meaningless experience. No wonder then that the best Hollywood films and cable television circa 2012 take place in worlds and times where this function of reverse surveillance and instant mediation can be avoided. It’s one reason why the scenarios and plot devices at work in slapstick films are so appealing: it’s far easier to fall into a problematic situation where Time and Space (this is cinema, after all) are obstacles to one’s existence. So, in comes this hilarious sight gag using a wired phone from Cold Turkey (1940) starring Harry Langdon and directed by 3 Stooges mainstay Del Lord. The prop carries a doubly deep sociological resonance for the actor. Harry Langdon was a giant in the silent era but in the sound era he was ruined, even though I think he has the best delivery of the silent clowns. [I actually think that his humor has always been a bit weird and dark, but once audience fit the voice with the actions this natural strangeness became more transparent and not to everyone’s taste (though biographers attribute his career downfall with a longstanding feud with the popular and powerful Frank Capra).] In Cold Turkey, four years before his death, Langdon uses a cousin of the microphone, the telephone, to signal why conversations over the phone can never be as funny as a gag that uses real time and space to it’s advantage, as was done one and two decades from this point. Far from exhibiting mere post-modern self-reflexivity, we see the spectre of slapstick physically imposing itself into a world that has begun to forget it’s strength and will soon fully forget. The physical attributes of the phone are funny: its’ hard so you can hit someone with it; it’s connected by a wire so you can tug-o-war with it. But, the way society is hacked up and hung on display with them is, well, to a comic, more boring than tragic. This is Harry Langdon as a human doorbell in 1933’s The Stage Hand. Besides Chaplin, who in the early sound films uses the new technology as just another prop in his comedies instead of embracing realist verisimilitude (that is until 1947’s Monsieur Verdoux), Langdon is far and away the best silent clown to deliver hilarious lines. For instance, see the above. Of course just how funny this scene is is ironic because these sound shorts are produced near the end of a precipitous fall from popularity that began five years earlier by ticking off Frank Capra. Add this to the fact that most people who’ve heard of Keaton, Chaplin and who squint a little when you mention Harold Lloyd, shake their heads and change the subject altogether if you bring up Harry Langdon. Langdon is another figure in slapstick that expands on the issue of spoken word with particular genre of comedy, using idiosyncratic language so particular the jokes remain funny but also embrace something weird and unfathomable.